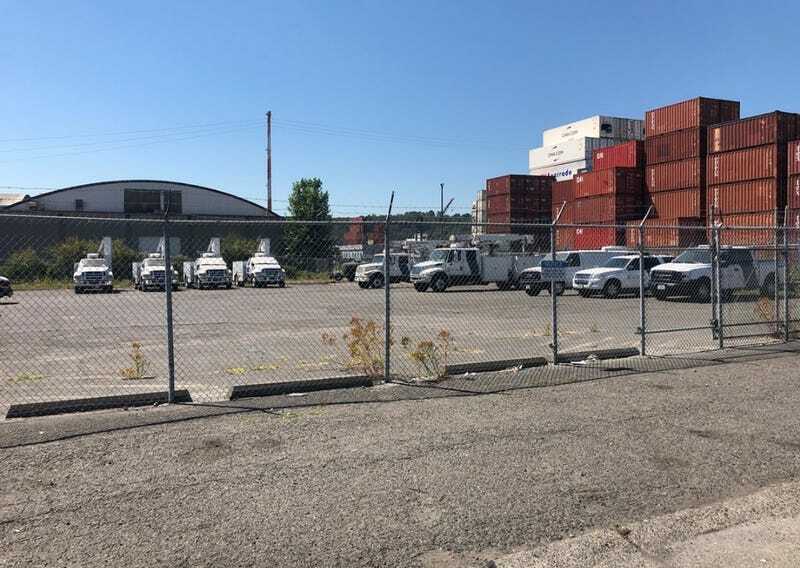 This is right on the water in Seattle, and due to hazardous materials powering the satellites in each vehicle, they have never been taken off sight and cleaned. Years and years being around salt water and accumulating dirt. That said... After sending a sales guy out to bid the job, in the images he sent me the trucks don’t look too bad. I think we can handle things with an application of 12.5% sodium hypochlorate followed by a medium pressure rinse with 8gal/min pressure washers. I’ll be sending out tons of brushes and random chemicals as a backup. What I’m less sure about is the “ceramics” they want removed. There’s some sort of manufacturing plant/factory/whatever in the next lot, and from what my on-site guy said, either it’s a ceramic manufacturer and has gotten hard to remove ddebris on the trucks, or... It’s gotten ceramic over the trucks. This is uncharted waters for me. Any ideas? First picture below is the offending factory, the rest are images of the vehicles.